Posted on Fri, Nov 25, 2011 : 1:37 p.m.
Work to reconstruct the Argo Dam headrace on the Huron River in Ann Arbor is moving along quickly, and many who've checked out the site lately say they're impressed. 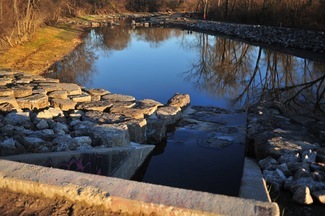 "It's awesome," said Ann Arbor resident Doug Siewert, a whitewater kayaker who looks forward to testing out the newly improved dam bypass channel in the spring. "I'm excited to see so much progress," he said. "And I'm just thankful that the City Council went ahead and approved the money for it, especially the tradeoff between just fixing the toe drains and having something beautiful for the city." One of the new features coming with the Argo Dam headrace reconstruction project is a wider and smoother Border-to-Border trail section. Livonia-based TSP Environmental, the firm hired last year to complete the $1.17 million headrace reconstruction project, has been hard at work since August. In a few short months, its crews have transformed the headrace — a 1,500-foot channel that canoeists and kayakers use to bypass Argo Dam — into a new series of drop pools surrounded by rocky formations. "Basically what we've done is taken a former diversion channel from the Huron River and built it into a series of nine pools for whitewater canoeing and rafting," said Robert Sherby, business manager for TSP Environmental, which has partnered with Beckett and Raeder and Recreation Engineering and Planning on the project. "These rock formations are basically finished," Sherby said at the site on Wednesday. "This is basically the way it's going to look, just with obviously more water flowing." A stop log remains in place, keeping water from flowing through the headrace. In the spring, that will be pulled and kayakers and canoeists will be able to venture down a free-flowing channel that connects directly to the river — now that a portage has been removed. "It'll actually end up looking like a mini waterfall," Sherby said of the slight drops from pool to pool, which he said novice canoeists and kayakers should have no trouble with. "I've seen us out here testing it and it looks like it's a pretty cool feature," he said. "It should be a lot of fun once it finally gets open and running." Argo Dam and Argo Pond are located just north of downtown Ann Arbor, accessible off Main Street near the railroad tracks north of Depot Street and from the east of the river off Longshore Drive, where the city's canoe livery and parking facilities are located. The city originally undertook the $1.17 million project in response to orders from the Michigan Department of Environmental Quality in 2009 to address concerns about the stability of the earthen embankment that separates the headrace from the main river channel. The city decided to do more than just a bare-minimum fix of the toe drains, which would have cost about $700,000, and decided instead to pay extra for an improved amenity. The Ann Arbor City Council agreed earlier this week to additional work to enhance this low-clearance entry area to the Argo headrace. Other new features coming with the project include a wider and smoother Border-to-Border trail section and a 30-foot bridge along that trail that was installed this week. The bridge runs above the new cut to the river at the end of the headrace. 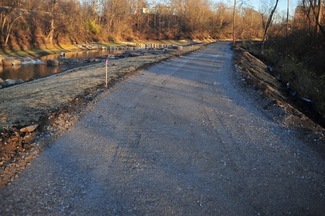 Two whitewater features in the Huron River, just after the bypass channel, are expected to come in 2012. DTE Energy has agreed to pay for them since the area is adjacent to DTE's property along the river and the company has to do remediation work there anyway. The City Council voted earlier this week to use some of the cost savings from that to increase the scope of the project and have TSP Environmental construct an improved headrace entrance. The current entrance is a narrow concrete culvert with low head clearance, and now that will be replaced with a more-attractive steel bridge. Colin Smith, the city's parks manager, said the cost of the bridge will be entirely offset by the cost savings realized from DTE's commitment to pay for the whitewater features. Tue, Nov 29, 2011 : 6:16 a.m.
For this amount of money we could have easily eliminated the dam altogether and restored the natural course of the river without the need to create this artificial &quot;water feature&quot; to challenge anyone who wants to canoe from the Argo livery to Gallup. Mon, Nov 28, 2011 : 9:21 p.m.
Great project, though I must say it was fun to slide down the old spillway on the seat cushion/floatation devices from the canoe livery back in the day. Sun, Nov 27, 2011 : 7:49 a.m. It was legitimate public debate which brought awareness of the need for this new facility. An aging eyesore turned into a community asset is the result. Glad of it. Sat, Nov 26, 2011 : 1:37 p.m. Removing a dam in most circumstances is the best action. That being said, I will hold judgement on the head race until next spring. I plan on taking my kayak through the area. I hope some of siltation will be be able to flow naturally down the new headrace (as in a natural river). I also hope some of the cooler &quot;bottom&quot; level water will flow downstream instead of just the warmer top water, as it does today. Sat, Nov 26, 2011 : 1:19 p.m.
Where will the public art work project, paid for by this project be located? Maybe a giant light bulb to honor Thomas Edison would be appropriate. Sat, Nov 26, 2011 : 4:29 a.m. Sat, Nov 26, 2011 : 3:28 a.m. This project seems eminently economical for $1.17 million dollars. What a very impressive accomplishment, indeed. The headrace will add immeasurably to the natural beauty of the area. I'll look forward to the trail reopening, too, as that is my prime jogging route to the trail through the woods along the Huron River to M-14. If anyone from DTE is reading this: PLEASE tone down your spotlights at the Broadway power station. When one is running back towards Broadway at night the lights are extremely bright and directly in one's eyes. I am a detail expert and notice everything. Those lights bother me. Sat, Nov 26, 2011 : 6:03 p.m. I'm looking forward to the trail being open too! The detour on the streets involves BIG hills which are probably good for my running but I don't like them!! Sat, Nov 26, 2011 : 2:36 a.m. I can't wait for spring so I can try out the new headrace! Ann, I don't think you can draw any conclusions from the number of &quot;Argo&quot; lifejackets at Gallup. I know business at Argo was down significantly last year becaue you couldn't use the headrace for the Gallop trip. There was a temporary launch just below the dam at Riverside Park, and most people who wanted to make the trip parked at Gallup and took a van to Riverside. Van service was also available from Argo, but this wasn't as practical or as popular, since it required a second van ride back to Argo, once you finished the canoe trip. With the new headrace, I'm sure business at Argo will hit a new high next summer. Somehow, they'll sort out the life jackets. Sat, Nov 26, 2011 : 2:26 a.m.
Love it! I can't wait to shoot the new rapids and ride my bike along the shore! Fri, Nov 25, 2011 : 9:24 p.m.
What a wonderful improvement! Argo livery has been very popular recently, and it will be all the more so in 2012. A big thank you to all involved: City council, the parks department, DTE and the citizens of Ann Arbor for caring about our public spaces and quality of life. Sat, Nov 26, 2011 : 12:40 a.m. If the Argo canoe livery really has been very popular in recent months, maybe they donated lifejackets to Gallup Park last summer, still saying &quot;ARGO&quot; on the back. When I visited the Gallup Park canoe livery and saw those lifejackets, I at first thought they were only being borrowed. Fri, Nov 25, 2011 : 8:22 p.m.